Density: 191dph & 645 hrh. Awards: Haringey Design Awards 2016 shortlisted. This high-density urban regeneration scheme replaces poor quality buildings, vehicle repair and car wash shops, which once disrupted an otherwise residential neighbourhood, with 42 homes and more than 500 square metres of affordable work space. Engagement with the local community revealed that, whilst neighbours were ready for regeneration, they were concerned about losing local businesses. So a new enterprise centre supporting local start-up businesses was also created as part the scheme. The scheme completes the urban block with a south facing internal courtyard garden and large self-contained virtual family houses. Campsbourne Road was also widened to create a new foot path, space for street trees and on street parking bays. The project was Runner-up in Haringey Design Awards 2016. 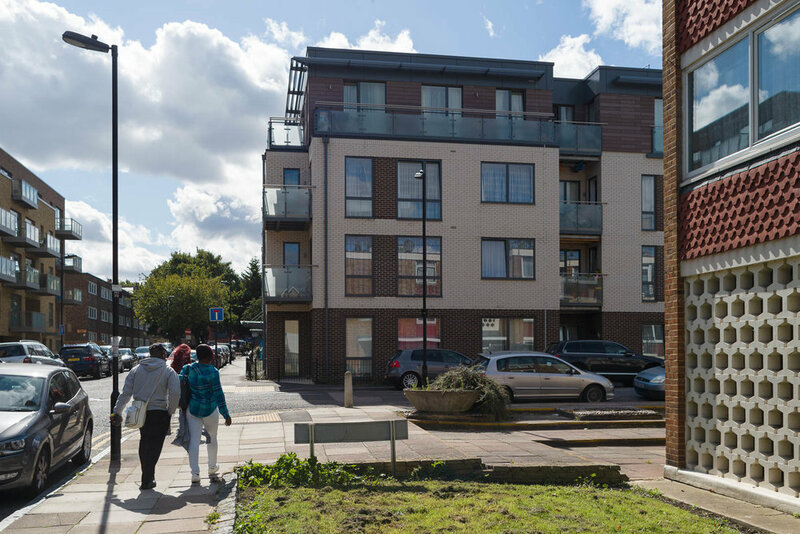 “We’re delighted that Campsbourne Road has been shortlisted in the Haringey Design Awards. KCA architects played a pivotal role in the project and we are very pleased with the design of the scheme. They were a great team player and we couldn’t be happier with their work.” Ranvir Bairwal, Assistant Development Director Circle Housing. “…the flat you have created for us is an absolute pleasure to be in. It struck us that the building has been conceived to an unusually high standard for social housing.” Resident Riddell Court, Campsbourne Rd.